"There is no fun in earning money if you cannot spend it. : Gaurav Kumar"
The best way to find out how much a person is earning by learning how much he is spending. People still ask me how much money I am making. Long ago I have stopped sharing my earning reports. Whatever I share on eAskme is there to help others and motivate them, but I see that earnings reports are not the best way. I have decided to share what I have spent to give a glimpse to the people who want to know about my earning or earning a professional blogger. I like to tell you that there is no limit on how much money a blogger can earn. In 2018, I organized multiple giveaways worth $10,000+ for the readers of easkme. But before I tell how I spent money in GiveAways, you should know how eAskme giveaways work. Don't worry I will not make the post too long for you. eAskme giveaways are one of the most lucrative and attractive parts of eAskme available for people. Every year we are spending thousands of dollars in Giveaways to reward the time visitors are spending on eAskme.com. 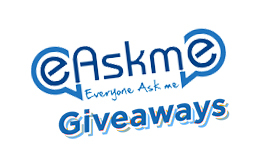 These are the super easy steps that anyone can follow to be part of eAskme giveaways. You can check out the complete list of giveaways I have started on eAskme.com. Many of you may be thinking that why I am spending that much in Giveaways. Why have I spent $10,000+ on GiveAways in 2018? Most of the people run giveaways to attract visitors, generate leads, find the potential market or understand buyer personas. But I have something more than that. I run giveaways, not just for traffic or subscribers but also to thank the people who share their love by visiting, liking, commenting and sharing blog posts. I am into blogging business, and this is the business where you make money by helping others. And more clients mean more money. From the last five years, I have been running giveaways to appreciate the love of my blog subscribers and visitors. I have bigger plans for 2019. In 2019 also I will be running contests and giveaways to appreciate not only the visitors but also the professionals. 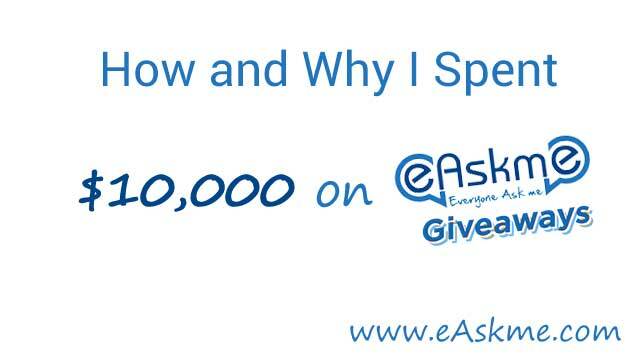 To be part of every giveaway and win more from eAskme.com, keep visiting and sharing the posts you like. If you want to participate in upcoming giveaways and win prizes then like us FB and join eAskme newsletter to stay tuned with us.